News from Fraser Yachts that Richard Earp has closed on his listing for sale, the 59m expedition yacht Capella C, with Yves di Lena at YDL Yachting acting for the buyer. Built in steel as a pilot vessel by Holland’s Scheepsbouwerft Pot yard, she was delivered to the Dutch Navy in 1968 and was converted into a luxury yacht in 1985. 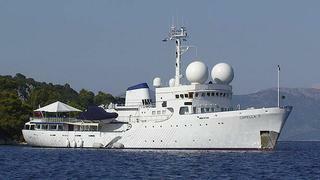 Last refitted in 2008 and now Lloyds classed, Capella C sleeps 22 guests in 12 staterooms with 17 crew. This classic superyacht features a private owner's suite including a lounge, children’s quarters, dining area and huge deck spaces for al fresco relaxation and entertainment. She has a proven cruising record of two circumnavigations and triple 600hp Deutz diesel-electric engines give her a range of 4,500 nautical miles at 11.5 knots. Capella C was asking $4,990,000.